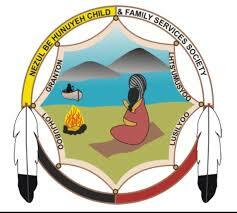 Education is a continuous process that enables each Tl’azt’enne to reach her/his fullest potential. The roots of education are planted in families, cultural values and traditions. Individual growth is dependent on a team of educators committed to the principles of motivation, encouragement, support and success. At Eugene Joseph Elementary we are proud of our students, our parents and our community. We believe that all students, given the right support, can learn at a high level. We expect that all students will graduate and go on to some form of post-secondary education. This poster explains our philosophy better than any words. It is important to note that the students created the poster, including the slogan, completely on their own. The students explained that the symbolism in the poster is the teachers supporting the students. This may seem like an obvious answer, but it took a lot of hard work on behalf of the staff to get all the students believing that they can learn. Every student is broken into literacy groups based on their reading levels. They receive small group instruction for 1.5 hours a day. In order that we can monitor the progress of students we do two standardized assessments, DIBELS and PM Benchmarking. These two assessments also allow us to analyze student needs and target instruction where it will have the greatest effect on improving student learning. In each class the students are broken into ability groups to receive instruction at their learning level. This is the pride of our school. Every student receives at least 30 minutes of Language and Culture each day. We encourage staff and students to speak Dakelh as much as possible. The belief at the school is that this is who we are and that the land, culture and language must work together. Without a knowledge and connection to all three it is difficult to understand who we are and where we come from. In addition to the daily instruction the school does two important invents: in February we have the Winter Cultural Celebration and in May we have an All-Clans Potlatch. The school encourages field trips that are connected to the school curriculum. The staff and students are working on finding ways to fund raise for the end of the year field trip. The trip will depend on the amount of money they raise. The philosophy of field trips is to enhance the student program and not just because we want to go somewhere. They are to give students opportunities that enhance their learning experience. Tl’azt’en Nation is currently recruiting 3 elementary school teachers. Please watch this page for further announcements and an introduction to our new staff. Delores is a community member. She spent two years at university to become a teacher. She is a loving caring member of our school team. She believes in all our students. Leonie has worked in the school for over 15 years. She is flexible and will work with any students that she is assigned. Chris has worked in the school for 2.5 years. works 1-1 with an autistic student. He is a willing member of staff and will volunteer wherever he is needed. His quiet demeanor and cultural knowledge is greatly appreciated by all. Crystal has worked for EJES for over 5 years. She took a year off two years ago to complete her Level 1 CASS (Teacher Assistant Level 1). She believes that all the students can learn to high levels. Charnel has worked for EJES for over 2 years. Her friendly demeanor and assist wherever she is needed is greatly appreciated by everyone that comes into or phones the school. Kevin has worked for EJES for over a year as the maintenance person. The staff appreciates is wealth of skills and willingness to tackle any task immediately. Geraldine has worked as the spare driver for over 3 years. This year she has become the full-time driver. She is the first and last staff member the students usually see each day. She sets up their day and ends the day. The students seem to be arriving at school each day ready to learn.